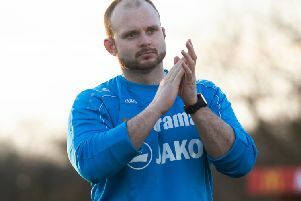 Hemel Town boss Dean Brennan is demanding that his players show their fighting spirit when they travel to Concord Rangers on Saturday. The Tudors go into the game on the back of a 1-0 defeat to Maidstone United on Tuesday night, which followed three wins on the spin at the start of the new National League South season. Concord stick it to you and get right in your face. You’ve got to be able to stand up and match that. And Brennan knows that his side are in for another tough test on Saturday. “Concord are a good side, a very physical and aggressive team who play with good tempo so we know we are going there for a really tough game,” he said. “It’s a game we are really looking forward to and a different challenge than the ones we have faced so far this season. “We’ve always done quite well against Concord and I don’t think they’ve deviated much away from the way they played last year under a different management team. Despite praising his side for their efforts on Tuesday night, Brennan is looking for a positive reaction to the defeat. “We’re not too disappointed after the Maidstone game – I thought we could have created a bit more but I also thought that they defended really well on the whole. It was the start of the second half that killed us, really. “Good teams don’t get beaten two games in a row and we’ll try and make sure that we don’t get beaten, first and foremost on Saturday and see what we can take from the game. “Ed Asafu-Adjaye trained today for the first time so we will see how he is; we can’t really rush him back, we’ve just got to nurse him along,” said Brennan. “Frendo trained today for the first time, he won’t be available for Saturday but it’s a positive boost for us. “Oshodi looks like he’s getting there with his fitness so he will definitely be in the squad, but Mo Shariff is still about another week away.